Ján Levoslav Bella lived a long life, being well into his nineties when he died in 1936. He was born in Liptovský Mikuláš, now part of Slovakia, in 1843. Raised a Roman Catholic, after theological studies he was ordained priest in 1866. From 1869 to 1881 he held the post of director of music at Kremnica. In 1881 he abandoned the priesthood and converted to Protestantism, and took up a musical directorship in Hermannstadt/Nagyszeben, now Sibiu in Romania. For the next 40 years he made a name for himself as a composer and conductor, gaining the respect of Brahms, Hans von Bülow, Joachim and Dohnányi. On retirement he went to live in Vienna, but in 1928 moved to Bratislava where he spent the remainder of his days. He was prolific as a composer, and his works include opera, orchestral, chamber, piano and vocal music. His piano music, which really only has a secondary role in his oeuvre, displays the influences of Schumann and Liszt. It’s imbued with the Slovakian spirit and reflects contemporary Central European musical trends. The main focus in this recital is Bella's most important piano score, the four movement B flat minor Sonata. It was premiered in 1887, but then underwent some revisions in 1889. It's this later version we hear. The booklet notes go into great detail as to its evolution, which proves a fascinating read. Richard Strauss, no less, was impressed and may have offered some suggestions which were taken up by Bella. Strauss had held onto the manuscript for almost eighteen months, returning it with the comment: "Would it not be possible to fix it, in the sense of making the writing for the piano (technically) a bit more comfortable to play". The work commands a high level of virtuosity and Lisztian bravura. The opening movement contrasts tempestuousness with sections of passionate lyricism. Tender melody, emphasized by arpeggiated chords, informs the Andante slow movement. A martial theme makes an appearance along the way. There follows a quirky enigmatic Scherzo. A Schumanneque finale ends the work. It traverses a range of emotions from vigour, through ardent passion, to a funeral march. Bella calls time in jubilant fashion. The Variations on 'In Pressburg, by the Danube' date from 1866 and were revised in 1879. They were published at the composer's own expense. The theme is a popular Slovakian song, and is followed by three variations. They seem to grow from simplicity to the last which is in the form of a mazurka, ending the work with some impressive flourishes. The shorter Variations on the Slovak Folk Song 'A Swarm, A Swarm is Flying' (1872) begin with a dainty theme. In the three variations which follow Bella delights in torrents of cascades and roulades. The Sonatina in E minor from the following year continues in the vein of a catchy, attractive melody. The Four Little Pieces were penned between 1866-1869. Two Caprices are followed by a Fairy Dance which glitters and sparkles. A mercurial Capricietto ends the set. St Martin’s Quadrille (Slovak Quadrille) is the earliest composition from 1861. It consists of a collection of six dances. Bella drew on Slovak folk songs for his sources. Although light fare, they're both charming and appealing. The composer turned to another dance form for the Kremnica Fire Brigade Polka - a heart-warming morsel. Fast forward to 1927 and we have the Doll’s Holiday, Waltz for Piano Duet, where Pažický is joined by the pianist Martin Chudada, ending the disc with a smile. The beautifully produced booklet offers a useful commentary, in English and Slovakian, on each of the works, setting them in their biographical context. 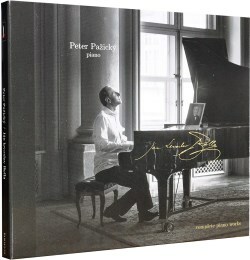 This is important in rare repertoire such as this, and Pavlík Record's efforts in this regard won't leave you wanting. Peter Pažický's impressive technical arsenal, does full justice to these captivating and compelling scores. He's been captured in first-class sound. As one who finds much to stimulate the mind in the unfamiliar, this release has given me much pleasure.